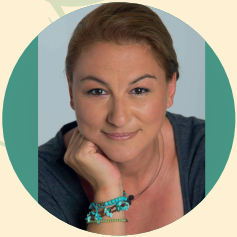 14 years ago, Katia Fotinopoulou was given a Reiki session.This was a turning point in her life. She decided to follow her inner voice and devote herself to complementary therapies, energy healing, and self-awareness. So she went back to school. Her studies include a Certification in Aromatherapy, Reiki Master, Ayurvedic, Deep Tissue, and several types of therapeutic massage, Bach flower remedies, Crystal therapy and MBSR (Mindfulness based stress reduction)seminar. Over the years she has been part of meditation groups, a women’s shamanic and healing, and currently following Crimson Circle. As knowledge is endless, she is a lifelong student, and devoted learner in order to enhance the quality and level of her therapies. And that is not only through the books, seminars, courses. She strongly believes that everyone of us is a lesson, an experience for the other. We all have something to learn from one another. This type of knowledge only makes us better and more aware people. Her wish: to travel, to learn, to experience, to offer, to help, to spread the light, the healing, the love. Experience is life and life is an experience. Katia works and lives in Athens but in the Summer of 2019 she comes to Kythera to offer holistic therapies that are created to promote a sense of deep relaxation & tranquility at the privacy of your own house, hotel room or terrace. In Greek “OLON” means whole and this is the word that this therapy is based on. A full body massage, treating the Body, Mind and Soul. Working on the physical level with ayurvedic massage based movements, the internal system via the absorption of therapeutic essential oils according to the individual’s needs and the etheric body by resynchronizing the body’s vital energy with reiki. This holistic massage is ideal for relieving muscle pains, encourages lymphatic drainage, improves blood circulation and aids in digestion. On a psychological and emotional level promotes a state of deep relaxation and release of anxiety and depression, and increases the positive feeling of well-being and self-connection. with depression, disturbed sleeping patterns, brings clarity of thought and emotions and a sense of self-acceptance and love. Chakra means “wheel of light” in Sanskrit. Our 7 main chakras, or energy centers are vortexes that spin life force energy in and out of our physical bodies. Each chakra is responsible for a certain part of our body and emotion. If a chakra does not function well, it creates several blockages affecting our energy, which in turn brings dysfunction in our emotions and body. During a chakra balance therapy, the energy flow of each chakra, is cleaned, and re-balanced, using crystals, pendulum, Tibetan singing bowls, breathing and visualization. After such a session, the receiver experiences his energy revived and re-tuned, feeling calm, relaxed and balanced. Meditation is medication!!! If you are not familiar with meditation practice, a helper, to guide you through the process is always useful. You will learn how to meditate, saving you time, effort and a question of “am I doing this right??”. Using a helper, you can try out different types of meditation, or discuss what kind of meditation suits your needs. Meditation benefits are abundant. Just to name a few, it quietens the mind, increases focus, reduces stress, lowers blood pressure, helps with sleep, increases self-esteem, powers self-motivation and brings a clarity of emotions and thought.